Send a basket full of Halloween dog treats and watch the fun begin! We have put together a delightful assortment of dog treats and dog toys for Fido and also gifts that include tasty treats for his owner! 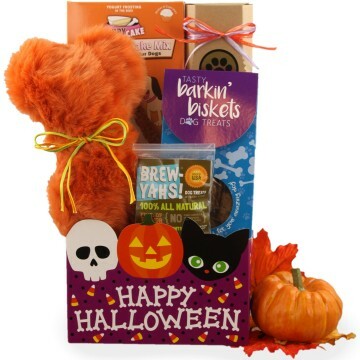 Our Halloween gift baskets for dogs and combination Halloween gift baskets for dogs are excellent Halloween gifts for the grand kids, nieces and nephews. included with all of our Dog Halloween Gift Baskets! Tricks or Treats Dog Halloween Gift PackageAdorable Halloween themed Chinese Takeout container filled with a selection of gourmet biscuits just for Fido! Don’t forget your favorite canine or pass out a biscuit to each doggy that visits your door this year. Dog Gone Cute Halloween Dog GiftThis Halloween dog gift really is too Dog Gone Cute not to send this year! Our doggy trick-or-treat dog gift is certain to impress your friend and his/her adorable pooch; with “treats” that include an assortment of bakery fresh biscuits and even a gourmet hand decorated biscuit that’s paws-a-tively PAW-SOME! Send some treats this Halloween season! Just for Dogs at HalloweenExpect some howling in your doggy neighborhood this howl-oween when our Just for Dogs at Halloween gift arrives. You know how the gossip is spread from dog to dog along the fence line every day but when this Halloween gift delivers the barking will be all about Fido and the new gift! It’s all about the doggy biscuits as we’ve included 2 beautifully designed and decorated gourmet doggy biscuits fresh from the bakery along with other ghoulish goodies. Let the gossip barking begin… woof-licious! Halloween Dog TreatsThis modern themed Halloween dog gift is making tails wag across the nation this October. Dogs may not like Frankenstein or Zombies, but they just love biscuits! With this special Halloween doggy gift, we’ve included some very fine gourmet biscuits that Fido is sure to love to munch on and perhaps not see those ghosts walking down the street. This festive Halloween doggie gift is certainly a universal gift and can be sent dogs of any kind. Halloween Ruffs Dog GiftEvery Halloween Fido does so well trying to contain himself while the doorbell rings and those pesky witches and goblins peek in to say BOO! Calm him down this year with his very own gift of treats with our Halloween Ruffs Dog Gift. Full of biscuits and even a “chill pill” this Halloween dog gift makes a perfect dog gift for your favorite canine friends. Halloween Barks and Wags Dog GiftWhen the lights go out who protects your family from the ghosts and goblins that attack and eat all the candy in your home? It’s FIDO! It’s time to reward Fido with his very own doggy Halloween gift. He will love you even more as he’s munching on these outstanding bakery biscuits.